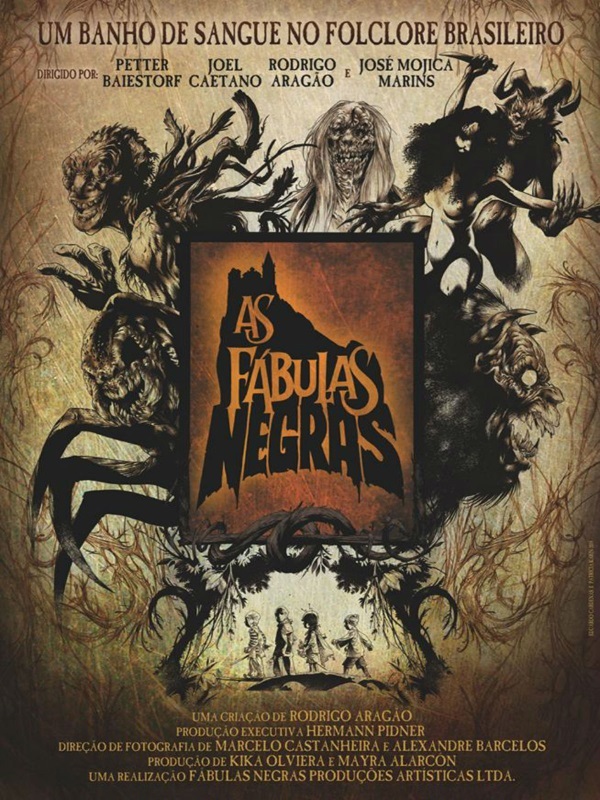 “As Fábulas Negras” is a horror anthology from Brazil. Like with all anthologies, the quality of the individual segments varies a bit. Before watching it, you should also be aware that this was shot for very little money, is extremely “indie”, and thus might come off a little amateurish here and there. Plus, there’s a cheap digital look throughout – due to the cameras that they used – that I found extremely noticeable, and that’s a little bit at war with the “once upon a time”-VHS-look that they seemed to be going for in the individual stories. Despite that, though, it’s a notable effort worth taking a look at. One thing that I really liked about it was the framing device, with kids telling themselves horror stories/urban legends. It immediately excuses some of the more unbelievable/far-fetched/crude elements of the individual stories. I also loved the first shot, with the children playing out some fantasy-story with plastic weapons and in costumes. It immediately brought me back to my own childhood. As for the individual segments: In my opinion, the first one was by far the weakest – but that’s very likely due to the fact that I’m not big on toilet humor and stuff like that, which is why I had a hard time with it, and found it mostly disgusting, but not much else. At least the twist at the end was nice. The second story was far better in my opinion. I loved some of the dialogue (“Whatever it is, we’re going to solve it with bullets”), and the re-transformation scene at the end will stick with me for a while, since it was quite different from what we’re used to from werewolf-movies. My only complaint is that the identity of the werwolf was quite obvious. Other than that, it was an entertaining tale. The Saci-story also was quite nice. I loved that they kept the question of if the monster really exist or if she’s crazy at least rudimentarily open (even though I’ll admit that they strongly indicate the former), and the scenes in the woods were quite atmospheric. The parents were a little clichéd and annoying, but I guess that was the point. Overall, it was ok. My favorite segment, by far, was the boarding school. It had a couple of really scary moments, some well-made jump scares, a great (if not very original) story, and it also featured a couple of surprising twists and turns along the way. Of all the stories, that was the one that I’d be interested in watching again in the foreseeable future. The final segment was quite original, since it did without any spoken words, but I felt that it was a little too short to really do its story justice. And the finale with the kids was… ok, I guess, even though I could have done without that final twist. Overall, though, I found it to be quite unique and charming, so if you’re not dead-set against trashy indie horror and are able to look past its cheap production values, you’ll get a varied horror anthology that offers a nice glimpse into brazilian folklore. This entry was posted in /slash, movie reviews, new releases and tagged /slash, /slash 2015, anthology, As Fábulas Negras, horror, splatter, The Black Fables. Bookmark the permalink.